the many indignities visited upon the young - Laughs! Thrills! Pathos! 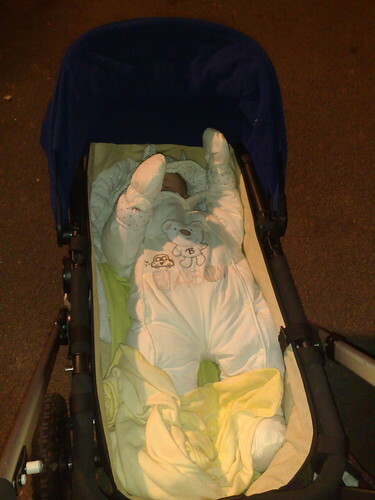 Yesterday, in the name of exercising our son* (Z: "Fresh air makes him drunk and more amenable to sleeping! "; N:"Just think how amenable he will be when we make him push this buggy up slopes!") we layered up and went to Primrose Hill. The baby ( being most congested and the least able to protest) earned the most layers - she was wrangled yowling into a snowsuit that made her look like the crucified Christ, and then bundled into a buggy whereupon her arms continued to stick at 90 degree angles to her body. Here is a picture of her slow martyrdom by snowsuit. Matei's interpretation: "I think the baby wants a hug". Poor baby, but I'm giggling so hard as "slow martyrdom by snowsuit". This whole entry has me tickled, actually.